Salacia (Celastraceae) consists of about 200 species. In China Salacia is represented by ten species, of which six have been recorded from Yunnan. During extensive botanical studies in nature reserves in Yunnan, researchers from Xishuangbanna Tropical Botanical Garden (XTBG) collected an interesting specimen of Salacia from Huidu Village, Mengla, Yunnan, China. After comparative studies, they confirmed it as a new species to science.and named it as Salacia menglaensis. The new species is a liana, reaching a height to 10 meters. It is similar to S. korthalsiana, S. glaucifolia and S. polysperma, but differs from them by the fruit size (2–3 x 2–3？cm), with only 1–2 mature seeds and by the non-glaucous abaxial leaf surface. There are only two known populations of Salacia menglaensis, both in Mengla. However, the population size is prone to decline due to cultivation of tea, rubber and other economic crops. In addition, the two populations are outside protected areas. According to criteria of IUCN, the researchers consider the conservation status of the new species as Endangered. 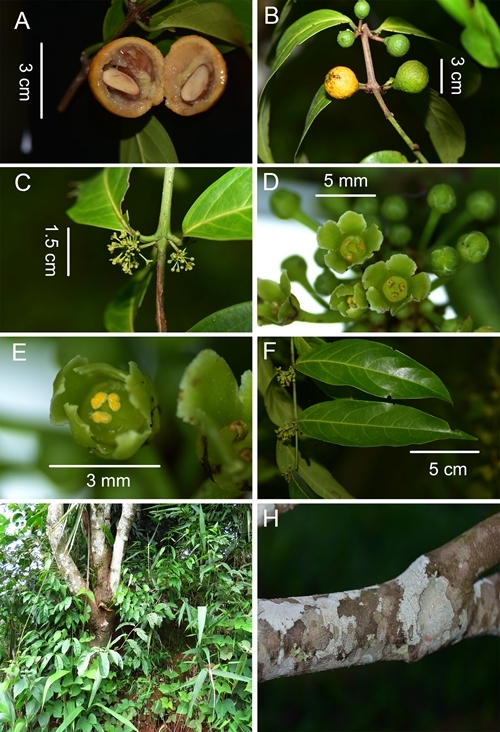 For more information, please refer to “Salacia menglaensis a new species (Celastraceae) from China” in Annales Botanici Fennici.